As such, the standout performance is by Sarah Green (Diana). She’s alive and animated on the stage at all times, giving her character life even in the rare instances when she isn’t the focus. Even during some more subdued scenes in the second act, there’s an understated spark that lets you know she’s the same person even though she’s changed. Ellena Grant (Natalie) nicely fulfills her roles in the primary and second storylines, as a bright but ignored teen who’s discovering that rebellion isn’t such a bad thing. Her outbursts, reactions, and subsequent actions ring very true. Grant is supported in the B story by Jordan Baldwin, who brings depth through his performance to what’s otherwise a one-note character (Henry, the “perfect”… boyfriend?). The other three men in the cast, unfortunately, aren’t given much to work with as characters. Like Henry, they’re written fairly flatly: one, after a certain point, is lit almost exclusively in red, indicating his malevolence; one is given some emotional solos that seem to come out of nowhere; and one plays two entirely interchangeable roles (probably a deliberate choice on the part of the writers). They’re all important to the plot, and all of the actors are capable of what’s asked of them, but there’s not much meat there; in two cases they’re primarily foils for Diana, and there’s a more than casual suggestion in Megan Moorhouse’s direction that Diana has a relationship with the last that’s completely inappropriate for any number of reasons. The minimal set—a dining room table, some chairs, and some art—is well-used to represent various scenes, including a surprisingly effective piano studio (with some of the more credible fakery of playing the instrument that I’ve seen anywhere). The ambitious lighting doesn’t fare quite as well, with several changes that seemed unnecessary and blocking that put some of the actors in shadow. I’m torn on the thrust layout; on one hand, it suits the “room” idiom of the production, but it also restricts the ability to separate locations to merely happening upstage (in the “dining room”) or downstage (generally office space). Despite being in the small confines of the Bruce B. Johnson Theatre, the actors and musicians are all amplified. I suppose that’s because this is a “rock musical”, but it’s to the production’s detriment: the lyrics are muddied, often beyond comprehension, when more than two performers are singing, and they’re lost entirely when the actors try to modulate their dynamics and the band has kicked into a higher volume. The amplification is also completely non-directional; the actors, just a few metres in front of the audience, sound as if they’re singing from the booth. 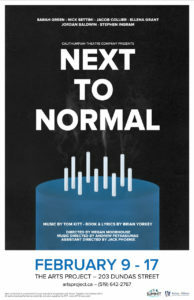 Despite these criticisms—and I haven’t mentioned the title drop or having the entire cast line up to deliver the big closing number—Calithumpian’s Next to Normal is worth seeing. It’s not the company’s best, but it’s got some excellent performances. Starlight Tours composer Leslie Arden, at a recent panel discussion at the McManus, distinguished the Broadway Musical as a unique art form that’s rarely seen outside the United States; I think this is the sort of show she meant. Perhaps most importantly, it provides some insight into the effects of and treatments for one type of mental illness (for better or worse). 1Then again, the script won the 2010 Pulitzer Prize for Drama, so who am I to criticize? I don’t have a problem with amplification per se, so whether it was necessary or not for the performers (I understand why it is) is fairly moot. The overall levels weren’t too loud for The ARTS Project, the sound system just failed to do its job, by making it harder to hear the singers and lyrics. However, to your point: unless I missed something, all of the instruments, including the percussion, were amplified, which suggests to me that the volume of the band was entirely controllable. As an instrumentalist, I also know that I can control the volume of my instrument; you’d be surprised how quiet a trumpet (for example; there were none in the show) can be. So I think the band shares some small part of the issue; if the point of having a live band in a performance is that they can react to what’s happening on stage, they should be able to adjust their dynamics to match.